Up until I lived in Vancouver I had never eaten pumpkin or squash before, other than courgettes of course, but then I was introduced to the wonderful variety of squash, especially in the fall. Now of course I have often made ravioli using butternut squash or hokaido as a filling, simply by halving, deseeding and then chopping into chunks, then on a baking tray seasoning with salt, cracked black pepper and cracked chili flakes, drizzled with a good olive oil and then baked until soft. However, I had never made a soup! Last week we had Halloween coming up and I thought of using the pumpkin flesh from the one I always carve for our doorstep, but then I saw a butternut squash and of course remebered the wonderful flavour it has and I was sold. I looked for a recipe found one, printed it out and made the soup on the basis of the recipe. Now I have to write down the recipe, I cannot find the print out, so this is now my own recipe and delicious it was too! Heat the olive oil in a pan and then fry the bacon until crispy. Remove the bacon from the pan and then fry the garlic and onion until soft in the oil and bacon fat. Pour this into a pot and add the chopped sage, carrot and butternut squash along with the stock and bring to a boil. If you have not got any stock then you can, as I do sometimes do, use one of the jelly pot stocks from Knorr, oxo or Maggi. They work just as well. Now the pot is boiling reduce to a simmer for about half an hour or so until the butternut squash is soft. 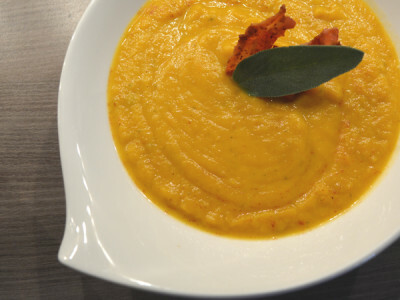 When the butternut squash is soft and cooked through chop a couple of the bacon rashers and add them in then whiz the soup with a hand blender or pour it into a liquidizer and pulse until you have a smooth purée. I leave some small chunks in there for texture. This is the time to taste and season it until it’s perfect before serving. Serve it into bowls and add a couple of bits of the crispy bacon and a sage leaf on top for decoration. My wife asked me where the sour cream was…oops I had forgotten , but you can also put a blob of sour cream on top then place the bacon and sage leaf!